The scale factor duality is a symmetry of dilaton gravity which is known to lead to pre-big-bang cosmologies. A conformal time version of the scale factor duality (SFD) was recently implemented as a UV/IR symmetry between decelerated and accelerated phases of the post-big-bang evolution within Einstein gravity coupled to a scalar field. The problem investigated in the present paper concerns the employment of the conformal time SFD methods to the construction of pre-big-bang and cyclic extensions of these models. We demonstrate that each big-bang model gives rise to two qualitatively different pre-big-bang evolutions: a contraction/expansion SFD model and Penrose’s Conformal Cyclic Cosmology (CCC). A few examples of SFD symmetric cyclic universes involving certain gauged Kähler sigma models minimally coupled to Einstein gravity are studied. We also describe the specific SFD features of the thermodynamics and the conditions for validity of the generalized second law in the case of Gauss-Bonnet (GB) extension of these selected CCC models. G. ’t Hooft, Local conformal symmetry: the missing symmetry component for space and time, arXiv:1410.6675 [INSPIRE]. G. ’t Hooft, Singularities, horizons, firewalls and local conformal symmetry, arXiv:1511.04427 [INSPIRE]. A.D. Linde, Inflationary theory versus ekpyrotic/cyclic scenario, talk give at the Conference on the Future of Theoretical Physics and Cosmology in Honor of Steven Hawking’s 60th birthday, January 7–10, Cambridge, U.K. (2002), hep-th/0205259 [INSPIRE]. U.d. Camara, C.P. Constantinidis, A.L.A. Lima and G.M. Sotkov, Self-duality from new massive gravity holography, JHEP 05 (2013) 013 [arXiv:1302.5795] [INSPIRE]. H.B. 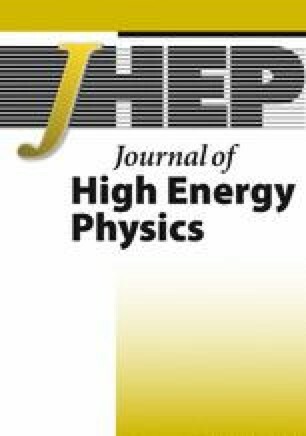 Benaoum, Accelerated universe from modified Chaplygin gas and tachyonic fluid, hep-th/0205140 [INSPIRE]. P. Tod, The equations of CCC, arXiv:1309.7248 [INSPIRE]. R. Kallosh, Planck 2013 and superconformal symmetry, arXiv:1402.0527 [INSPIRE]. K.A. Meissner and P. Nurowski, Conformal transformations and the beginning of the Universe, arXiv:1506.03280 [INSPIRE]. G.M. Sotkov, A.L.A. Lima and U. Camara da Silva, On the thermodynamics of scale factor dual Universes, arXiv:1609.00393 [INSPIRE]. U. Camara dS, A.A. Lima and G.M. Sotkov, Energy density bounds in cubic quasi-topological cosmology, arXiv:1304.4185 [INSPIRE]. R. Brandenberger and P. Peter, Bouncing cosmologies: progress and problems, arXiv:1603.05834 [INSPIRE].